Under new California guidelines signed into law in January 2009, any manufacturer or marketer of “small cans” of refrigerant must be certified by CARB in order to sell the product in the state. The certification requirements include compliant containers with self-sealing valves, new consumer usage instructions, and an approved used can deposit and recycling program. IDQ was the first manufacturer to receive certification from the California Air Resources Board (CARB) to sell small containers of automotive refrigerant in California. Please click through the links below for additional information regarding the guidelines for both consumers and distributors. A/C Recharging is Fast and Easy! Check vent temperatures while charging. Cooler air should result as you’re adding refrigerant. 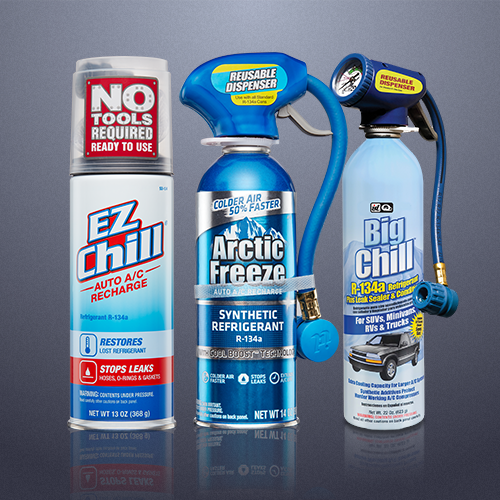 If you have added a can of refrigerant and are not getting cooler air – STOP! – and see a professional! You may have leaks requiring repairs to the system. Be Cool, but Be Responsible! Did you know refrigerant R-134a is a greenhouse gas? If leaked into the atmosphere, it contributes to global warming. You should know the mobile A/C industry is working on long-term replacements for R-134a. Until then, we join with the State of California in the following measures to ensure proper, responsible use. The State of California has determined that R-134a, the refrigerant used in your car’s A/C system, contributes to Global Warming. Effective January 1, 2010, California law requires all purchasers of small containers of refrigerant marked for deposit and return to pay a $10.00 per container deposit at time of retail purchase and return all purchased, used containers for recycling within 90 days to the retailer where purchased for a $10.00 per container refund with valid proof of purchase. It is illegal to destroy or discard used or unused small refrigerant containers under Section 95360 et seq. of the California Code of Regulations. AT THIS TIME, THE DEPOSIT AND RETURN PROGRAM APPLIES TO SPECIALLY MARKED CONTAINERS AND ONLY IN THE STATE OF CALIFORNIA. Returned containers are recycled and unused refrigerant recovered. Retailers located in California now have special requirements necessary for the sale of R-134a refrigerant to be used in automotive A/C systems. These regulations are fully explained in the downloadable guide below.